At work, a misbehaving web app was causing Apache worker threads to get indefinitely "stuck" in "W" state (Sending Reply), not returning anything to client, but taking up a chunk of CPU (often maxing a single thread at 99%). 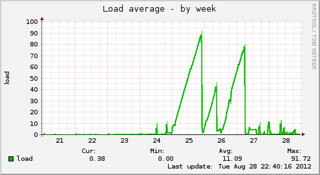 As additional requests for problematic pages came in, they would eventually tie up all available processor capacity, leading to high load averages (worst it got was a load average of 90 while googlebot was crawling) and a very sluggish server. Problem would get "resolved" by restarting Apache, but of course that killed all the clients, so needed a more targeted solution. While the developer is investigating, as a stop gap measure, came up with this script to identify and individually terminate these stuck Apache workers and log the request URL for later analysis. At first, I had monit run it whenever Apache CPU usage exceeded a threshold, but that wasn't often enough, so now it's called by crontab at 1 min intervals. If no Apache worker threads match the pattern, the script silently exits. So far, it's worked really well with zero false positives, though of course this is a temporary stop gap measure and not something I'd run normally. echo " Stopped on $(date +%F\ %T)"
Thanks for sharing your work. I appreciate ! I did just a little change to be able to use it. thx a lot. I have an odd problem and can`t find the bug in my conf. hope now I can get rid of it! Did you ever figure out what was causing the Apache worker threads to get indefinitely stuck? That was over two years ago, so I had to look it up. 😉 But yes, it was an application level bug. The developer found some bad code that was causing an endless loop when some pages were requested with certain query strings.